At the start of the game, you may think that you don't need Division 2 printer filament but by the time you reach the endgame, you'll be searching for it in droves. 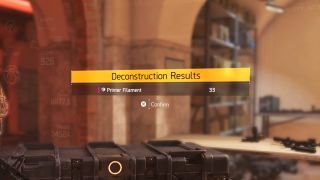 Other crafting materials in The Division 2 are fairly easy to come by but you'll easily find yourself short of Division 2 printer filament if you don't know how to obtain it. You can get a head start by following this guide, which has everything you need to know about Division 2 printer filament including what it is and how to get it. Printer Filament is a superior crafting material in The Division 2, and it's used for two things. The first is crafting Gear Mods; both Protocol Gear Mods and System Gear Mods in the crafting bench menu requires a number of Printer Filament each time. The effects you get on the Gear Mods you craft are completely random, so you'll need to farm up a lot of Printer Filament if you're searching for a specific Gear Mod. When you reach the endgame of The Division 2, you'll be able to upgrade your crafting bench for each world tier you progress through. Right now, the highest world tier in the game is four, but when the first raid launches, that should increase to five. To upgrade your crafting bench, you'll need a lot of Printer Filament each time. Obtaining Printer Filament is actually somewhat easy, though it's much different to other crafting materials like Titanium and Polycarbonate. To get Printer Filament in The Division 2, you must deconstruct Gear System Mods, Gear Protocol Mods, and Skill Attachments. Essentially, deconstructing anything under the Mods section of your inventory will reward you with Printer Filament. The higher tier of item you deconstruct rewards more Printer Filament, so make sure you're deconstructing them and not selling them to the vendor. It's that simple. Mark any Mod you don't want to use as junk, then deconstruct it to earn some precious Printer Filament. Eventually, you'll have enough to upgrade your crafting bench high enough for those Exotics. As a quick tip, if you're on console and frustrated with the L2/LT button switching categories along with marking Mods as junk, move all the Mods you want to mark as junk to your stash first. That way, you can scroll down the list with ease and deconstruct them from inside your stash. Just getting started in The Division 2 and need to find some faction keys? Here's everything we know about The Division 2 Hyena Key locations, along with the Outcast Keys and True Sons Keys.